Thrift store challenge upcycled chairs: For this month’s challenge a set of bargain Ikea chairs picked up at a local jumble sale have been given a fabulous, fresh colourful makeover. I have to confess that this is a bit of a cheat as it wasn’t my upcycle but my craft buddy Leonie’s. In my defense, I was with Leonie when she bought the chairs. In fact, I even bought them for her (Leonie’s like the Queen in that she doesn’t carry cash!). Also as I did see the transformation first hand I think that gets me off the hook a bit. Leonie doesn’t have a blog and really doesn’t do social media so has nowhere to share her fabulous thrift store upcycle. Therefore, I’m really doing a friend a favour here by showing off her drab to fab upcycle. I could have pretended that it was my upcycle and you wouldn’t have known any better, but Leonie reads my blog. These chairs must have been the bargain of the month, they were bought on a local jumble trail (kind of like a yard sale), only £10 for all six. For my US readers, that’s about $2 a chair BARGAIN!. There wasn’t much wrong with the chairs. They were just some old IKEA dining chairs. Structurally they were sound but rather drab with lots of scratches and marks. Roll on a few weeks after our chair purchase, I visited Leonie’s house for a party. The first thing I noticed when I walked into the dining room (well besides the food on the table), was her fabulous upcycled chairs. Those rather drab Ikea chairs had been transformed into fresh bright chairs with funky seat pads. 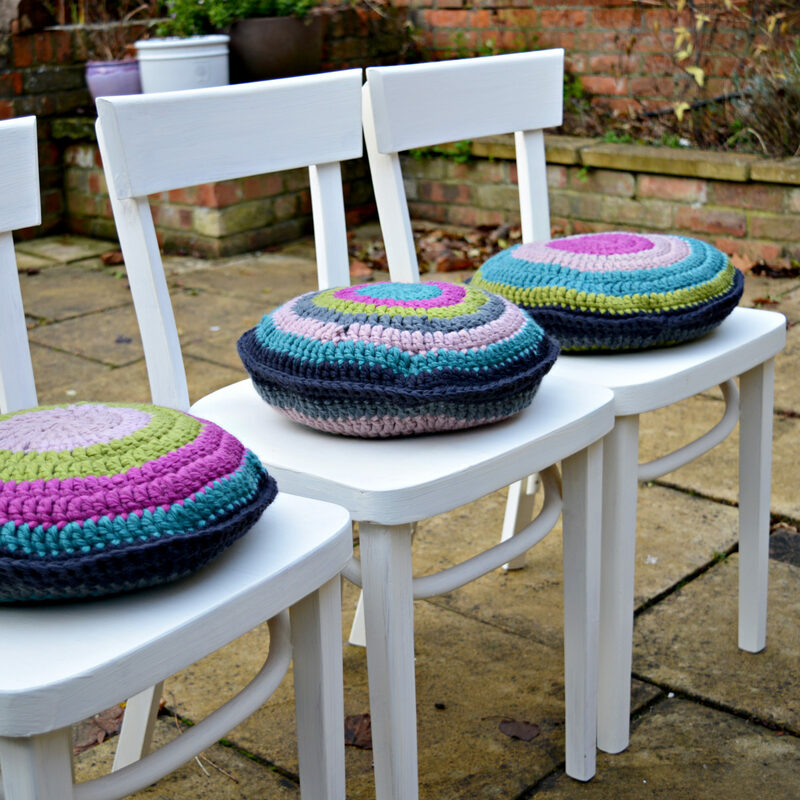 The crochet seat pads were what really transformed the upcycled chairs and gave them personality. Especially as every cushion was slightly different. Not only that but after sitting on them for the evening I can confirm that they were very comfy too. Rowan Big Wool for cushion pads in black, blue, green and pink. The beauty of chalk paint is that you don’t need to do much prep before painting. The chairs were just given a good wash. Once dried they were painted with the chalk paint. As the chairs were being painted a lighter colour 2 coats of paint were applied. 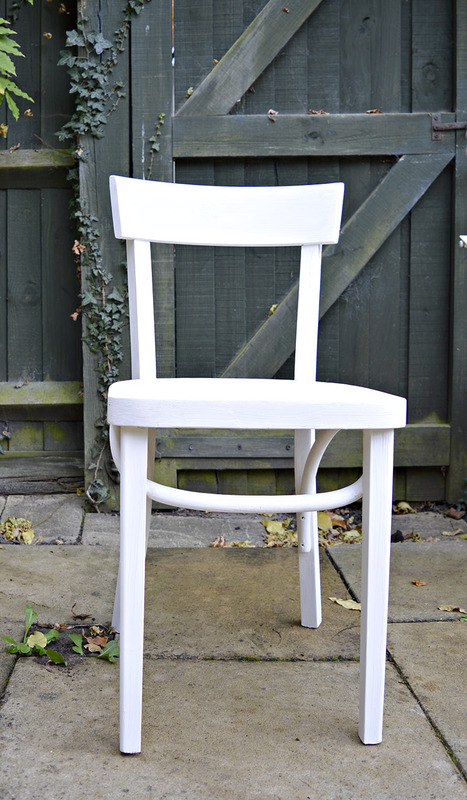 After the paint had dried a finishing wax was rubbed onto the chalk paint to seal it and protect the chairs. The cushion pads were the real show-stoppers of this upcycle. I was impressed, even when Leonie confessed to me that she didn’t crochet them herself! A local crafter made them for her (Cottage Gems) for a very reasonable price. The cushions pads are actually very simple to make, they are just basically one giant round granny square. Rowan big wool was used in a combination of colours; black, blue, grey, green and pink. If you look closely every cushion is different in the way the colours are combined. 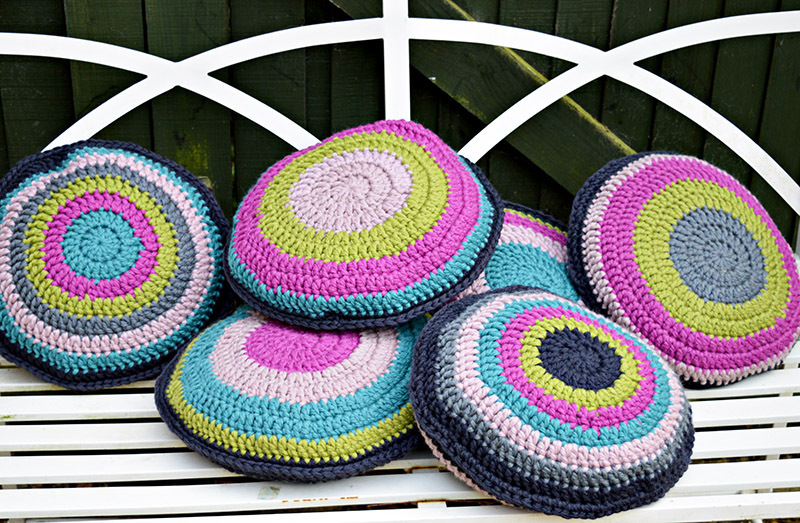 If you can crochet, then these cushion covers will not take long to make. Most good crocheters can make them without a pattern but if you are a beginner you should be able to find a pattern on Ravelery.com. 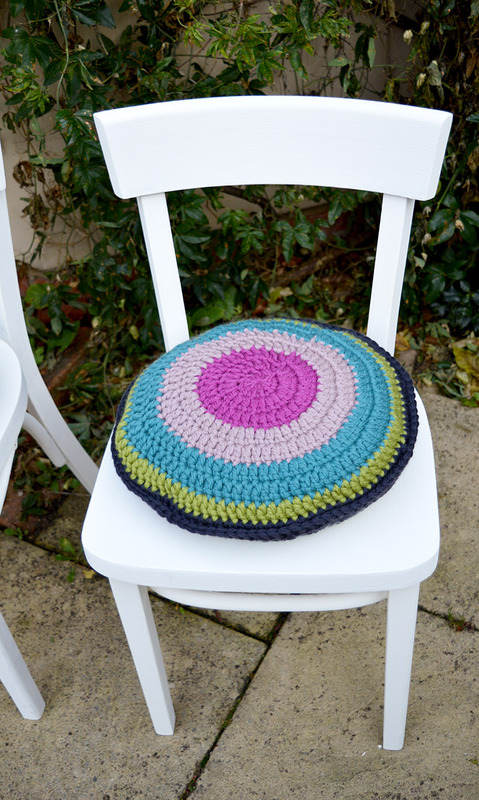 There is a free pattern on Ravelry for this round cushion using Rowan big wool. You will need to join Ravelry to access the free pattern but it is free to join. The colourful seat pads really pop against the white chairs and I love how every one is different. This is not Leonie’s first Pillarboxblue feature you should check out her popular Ikea Map table hack. For more fabulous DIY furniture ideas visit the DIYideacenter. Hi! Visiting From My Repurposed Life. I love how crisp and fresh this look is! So refreshing. Thank you? They certainly do look much brighter than before. I love the colour and the cushions what a bargain !! Thank you, the colours are great. You took the chairs from bland to beautiful. And they do look comfy. What a beautiful upcycle! I love the colors of those pads. 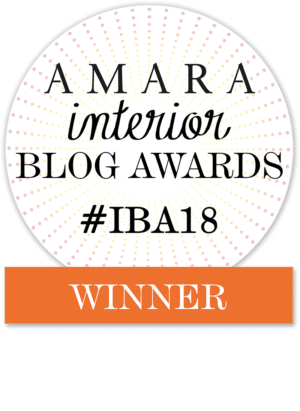 Thanks for sharing on Waste Less Wednesday Blog Hop! $2 a chair, what a steal! I would have bought them and scooted out of the store quickly in case the price was a mistake. Great job and I’m happy you were with Leonie that day.Thank you for sharing with us this week at Celebrate Your Story, have a great weekend. Thank you, more like a drug very addictive. Claire, the makeover these chairs received is great! Love those crocheted cushions!! Thank you so much, the cushions are a hit. These are fabulous. I love the bo-ho crochet chair cushions too. They are so sweet. Thank you for sharing. Very pretty! 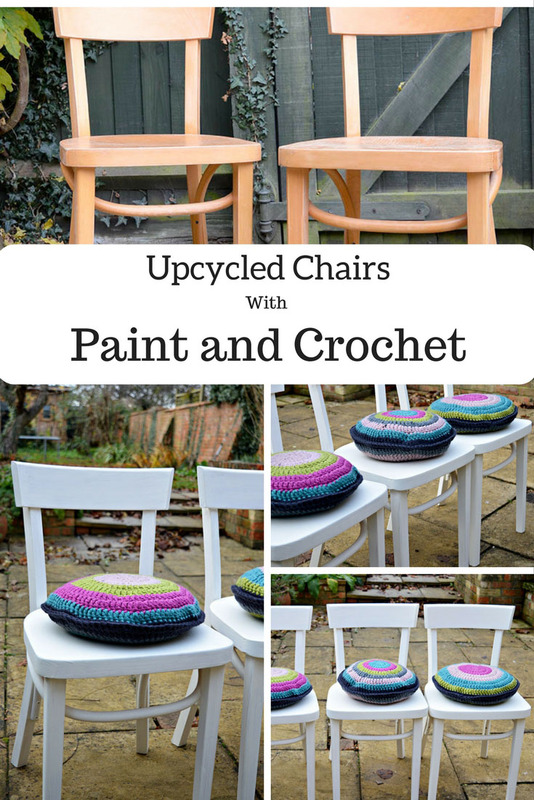 The colorful crocheted cushions really stand out against the fresh, white chalk paint on the upcycled chairs. These chairs look good as new, now — and for just $2.00 each! Thank you, I know what a bargain! lovely claire, love the colors of the cushions! thanks for sharing on craft schooling Sunday! Thank you, I thought you would like the colours as your site is so colourful. Adorable makeover, I love addition of the crochet seat cushions they really make it for me giving them a great vintage vibe! Thanks for sharing them at Fridays Furniture Fix! I love your long explanation of why you were forced to write this post even thought the upcycle was not technically yours. I buy it totally, in fact I think it would have been rude not to share this rags to riches chair story. They turned out fabulously. 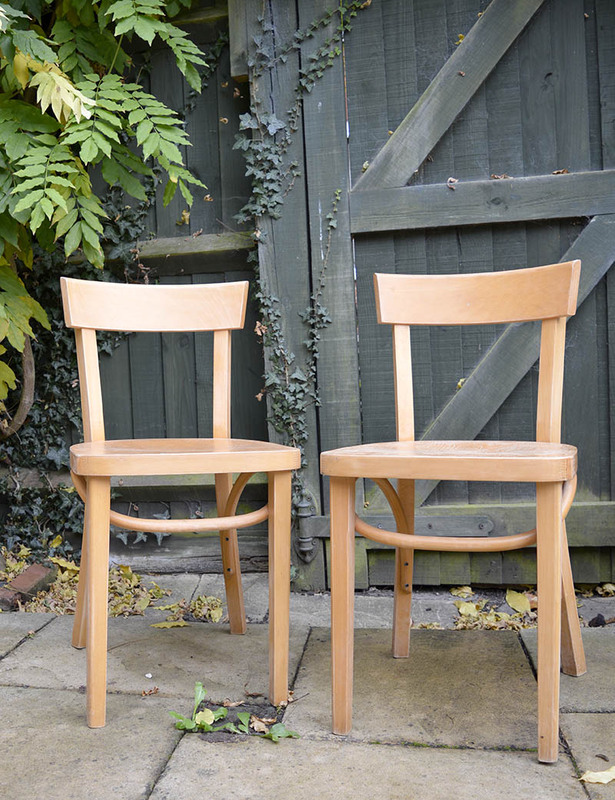 We have wooden ikea chairs, a slightly different style and they don’t really go in our new house (I say new house, it’s been nearly 2 years now!) they would look great in white like this…… A job for the summer methinks, thanks . Thank you Julie, yes I just had to share them. It is amazing how a lick of paint can transform things. Wow you got a great deal on those chairs, Claire. Love the bright cushions against the fresh white! Thanks for sharing @Vintage Charm! What a great friend you are 🙂 I love the way these turned out. Chalk paint to the rescue! Thanks, chalk paint is amazing stuff. I can’t believe we used to use horrible gloss paint on furniture years ago. Those are the cutest cushions ever!! The chairs are stunning. What a little white can do, amazing. Such a good idea to hijack your friends project and feature it on your blog, it deserves to be seen. Thank you, yes she didn’t have anywhere to share it and I thought it deserved an audience. 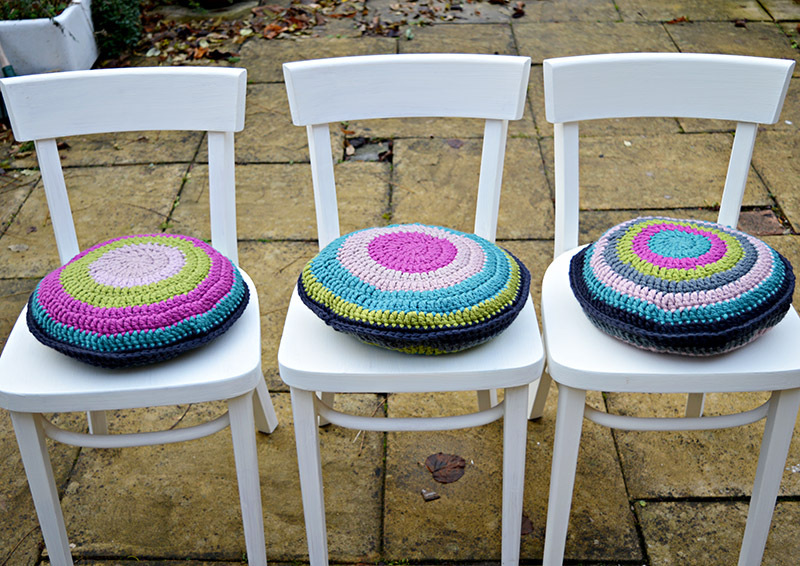 Love those chairs and the crochet pads in the jewel colours. Very inspiring. That is a great bargain on those chairs and they look better in white. And those cushions are too adorable, love the colors. How fun and colorful! Great job! You are a GREAT friend and Leonie did an awesome job on these chairs. Love them. Thank you and she’s a good friend too. They definitely look more fabulous in white! Beautiful chairs! Love the colorful cushions! These cushions are too cute! Love how they pop against the white of the chairs! Wow! $2 a chair. How lucky are you? Isn’t it amazing what paint can do? They look totally different. Love them. Those cushions are fabulous! They really pop on the newly refreshed dining chairs. Wthank you. I think it’s the colours she chose. What a steal at $2 a chair! And those cushions are so bright and fun! Thank ou so much Amanda, and thanks for organising. Those colorful pillows make me happy-happy! I’ll definitely be on the lookout for chairs to upcycle soon. Thank you, I think the cushions make the chairs. Those chairs look amazing and what a great price you paid. I love the cushions too. I can’t even get over how adorable the pads are and how they pop on that fresh white! She (and you too!) did an dorable job!!! Thanks, I would like to take the credit but she did all the work. I just helped her buy them. Those chairs were a bargain! Your friend did a fabulous job repainting and adding the fun crochet cushions. The chairs look so fun and cheery. Thanks, I do like their cheeriness. What a steal on the chairs, can’t beat that! I love the cushions! Thanks, they were an incredible bargain. I’m always amazed at what a little paint can do. So many people cannot see past what’s in front of them to see potential. These chairs look great. Thanks, it never ceases to amaze me how a lick of paint can transform something. Great transformation Claire! Love the term “jumble sale”. That’s new to me here in the US but it sounds better than “yard sale”! Visiting from Thrift Store Challenge. Thank you, I like the word Jumble sale too. When it’s outside people’s houses it’s called a jumble trail as normally quite a few houses in the neighbourhood participate at the same time so you just wander from one to the other. Otherwise, Jumble sales are community events held in places like Church halls and schools. We also have car boot sales. Oh wow love those crochet cushions! Sp pleasing to the eye 🙂 Great job claire! Thanks, I love those cushions too. The colour combination is great.